Torso pitch: -35° to +50° while standing. -35° to +60° while crouching. A Clan Medium Mech, the Shadowcat is an incredibly versatile platform with good speed, maneuverability, and firepower, making it worth every penny. 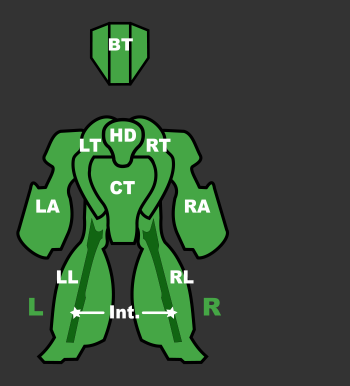 It absolutely devastates Light Mechs, and can go toe to toe with many heavier Mechs if used intelligently. Possessing speed nearly on par with light Mechs, as well as some of the hardest hitting weapons available, the Shadowcat is an excellent multi-classer. The only dull points that blemish the Shadowcat's otherwise excellent capabilities are its limited ammo space and a lack of armor, significantly lower than other medium Mechs. Shadowcat variants tend to carry their weapons almost exclusively in their arms, making them a prime target. The arms are also very lightly armored, if not always easy to hit. Protection of the arms is of paramount importance to Shadowcat pilots. The Mech's low profile makes aimed shots directed at a specific component extremely difficult, which is compounded by its high speed. As a result, Shadowcats usually have incoming damage spread throughout all of its components. The Shadowcat Prime is an agile sniper capable of dealing large amounts of damage at medium- to long-range. Armed with one CGauss and a pair of CERMBL's, aimed with the assistance of EOptics, the Shadowcat Prime is a grown-up Uller A, but with extra armor and maneuverability enhancing equipment. The MASC and Jumpjets, in their standard version, fixed to the chassis give it a mobility that most other snipers lack, but its single DHS, one more than the aforementioned Uller, helps it deal with the extra heat load. A free ton allows an extra reload for the CGauss, but the Shadowcat Prime must still make frequent return trips to rearm. The A variant is armed with one of the most powerful weapons in MWLL: the CUAC20. Fed by an extra ton of ammo, it has terrific damage potential for a medium Mech, and when coupled with its Improved Jumpjet-enhanced maneuverability and MASC system, the Shadowcat A makes for a terrifying hit-and-run brawler, a task for which half a ton of extra armor has been added. Three CERSBLs provide supplementary firepower capable of Anti-BA work, as well as finishing off units that manage to survive the UAC20 barrage. Despite this incredible killing power, the A variant futilely tries to manage its heat with but a single DHS, limiting its otherwise outstanding capabilities. The Shadowcat B is plays a similar role to the Shadowcat A, mounting a close-range, high-powered weapon. Armed with one LBX20, an SRM6 and a twin MGs, the B variant is all about close-range firepower. Utilizing MASC the Shadowcat B can close in quickly on enemy units before pummeling them with its powerful loadout. Improved Jump Jets allow the Shadowcat B to move along otherwise impassable elements of the battlefield, making it a mobile and very dangerous ambusher, especially in environments with lots of obstacles like urban theaters. The single free ton for reloads will make the pilot think twice before committing it to any of the two hungry ammo guzzlers. Especially as the Autocannon is more likely to be targeted by an aware adversary - it might prove wiser to carry spare SRM ammo to a duel. The single DHS will certainly struggle in hands of an rookie or anyone careless enough to overtax it with the many heat loading systems onboard this sophisticated medium war machine. While this units selling point is the quite overwhelming firepower in such a mobile package, remember it comes at a price - less heat capacity and most of the firepower gets shoot off early by an weary opponent. Not for the faint of heart. The C variant forgoes the comparably diverse loadouts of other Shadowcat variants in favor of extreme long-range firepower. Mounting one CERPPC and a Gauss Rifle, the Shadowcat C can deal huge amounts of damage at very long-range. When coupled with Jump Jets and Eoptics, the C variant is a deadly Jump Sniper, superior even to the Shadowcat Prime. One free ton allows a reload for the CGauss, giving the Shadowcat C moderate staying power. Losing the sole DHS of the Prime and gaining the blistering heat spike of the clan version of the particle projector cannon, along with the MASC standard to all shadowcats, makes this variant nice and toasty. Cramming all that load onto a Shadowcat meant that half of that free ton for reloads had to be stripped from its armor, making it one of the most fragile variants. The Shadowcat's agile chassis makes a natural choice for a NARC unit and the D variant fulfils such a role. Armed with a cNARC launcher it can use the equipment hard mounted on the chassis to stick a target designation beacon on a target before jumping back into cover. Its two backup weapons are two ATM launchers, one load with close range High Explosive munitions and one with far reaching Extended Range ones. The direct fire of its weapons doesn't make them too suited to take advantage of the variants own NARC beacons and with their ranges barely overlapping they can't be considered a reliable source of damage. Add to this the variant's lack of electronics and it's bound to stalk the battlefield in passive, turning on its radar mainly to get a lock for its beacons or possibly even dumb-firing them - a costly proposition but doable with two tons reloads. A single DHS is adequate for running the variant's equipment as it's not bound to raise its heat much through weapons fire. The Shadow Cat E is a heavy mid range damage over time mech. It does this job very well thanks to its one CHLL which can cause plenty of damage if the user can keep the beam steady on the enemy mech. Its 3 CMPLs help to exploit any weak areas that are created by the heavy laser. A great mech to take if you are looking to cut off enemy arms and more then one of these mechs can make the enemy's life rather difficult if the Shadow Cat closes range to fire. The mech hard mounts MASC and Improved Jumpjets as well which allows it make precise hit and run attacks on a target while its 6 Double Heat Sinks dissipate the heat from the Heavy Laser. Care must be taken not to fire the laser while using its equipment in straight on engagements as it can cause you to overheat, but heat conscious pilots can do some jump strikes with the use of cover. Any cockpit shake can also work against this Shadow Cat while its firing its laser and will cause its damage to spread out more. A stand-off Mech utilising almost exclusively long range weaponry. The primary weapon is a HAG30 reaching over 1250m. Backed by 2 Free Tons of ammo storage gives it staying power to inflict massive amounts of damage. At 900 meters the CERLBL inflicts pinpoint 692.31 of Energy Damage, helping to finish off your opponent. Both weapons are well supported for passive long range engagements by the EOptics package for keeping your eye on the enemy and the Improved Jumpjets allowing poptarting from behind any kind of cover. When caught in close range, it can utilize MASC to break distance, and resume long range offensive operations or even back capping a base. 1 DHS can handle the CERLBL. A night-prowler and a scout, hot in both roles, the mere DHS trio is heavily taxed by either the cERPPC or the feared ATM9(HE). All that's "money for nothing" are the two clantech small heavy-lasers, but still barely so. If the weapons stay silent, the movement enhancing equipment consisting of both MASC and improved jump jets will bring this unit far, and fastly so, however utmost caution is to be exerted not to rush into the height of a battle with the heat scale close to the alarm region! The GECM will provide for some leeway this unit will direly need in it's endeavors, but won't be able to cover any treacherous radar spikes that occur if the heat reaches over the alarm levels. Selling point? A scout, fast, mobile and with a firing solution for almost every range and quite many situations. For the experienced players with developed situation awareness and heat management. 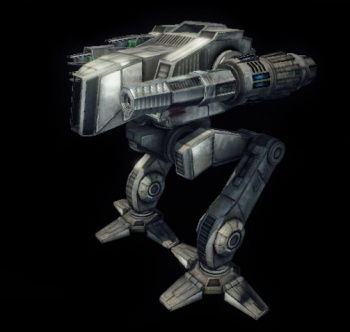 The Shadow Cat is a heavily-armed and maneuverable medium OmniMech developed by Clan Nova Cat to replace the Ice Ferret in the early 31st century during preparations for Operation Revival. It is one of the few invasion-era clan mechs to lack a separate Inner Sphere designation; all Inner-Sphere pilots who encountered it before the battle of Tukayyid died, and Com-Star was informed of its designation before that battle, resulting in both sides using the same name. The Prime variant of the MWLL Shadowcat lacks the Active Probe of the CBT Shadowcat, and hard-mounts Improved Jump Jets rather than standard ones. This page was last edited on 13 February 2019, at 19:07.